Looking for something a little different for your Nano? 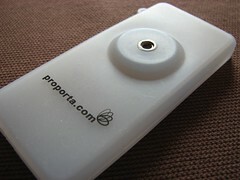 Consider the Proporta Protective Silicone Case. This lightweight and discreetly designed case has a party trick up its sleeves. The case is made of a silicone material which contains a chemical that reacts to temperature. In colder temperatures the case becomes blue and when it’s warm, it turns white. How cool is that! Coming in at Â£11.95 this case is fantastic value for someone whose looking for a basic case that will protect their Nano from everyday scratches, drops and knocks. You can also choose from a range of three colours including Charcoal and Pink. The screen and scroll wheel is left uncovered by the case so you have full access and on the back there is the ability to attach a belt clip to it. The belt clip looks to be fairly standard as it’s big, black and bulky in comparison to the case itself. You will also find a lanyard in the box that you can attach to the case which is a nice touch. One issue that I did find with the case is when the case is in temperatures that aren’t so warm but not so cold either. 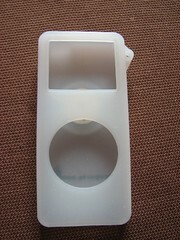 This gives the case an uneven shade of colour which is meant to represent the case being warm. Whilst some will like this, I wasn’t too keen on it. However when keeping the Nano in your pocket, this is generally warm enough to make the case go white. Found it a bit odd that the packaging doesn’t state that this case is colour changing, which is unusual because you would think this is a marketing aspect for the case. On a shop shelf you wouldn’t really be able to tell this case apart from the other Proporta cases in similar packaging and made of similar designs. 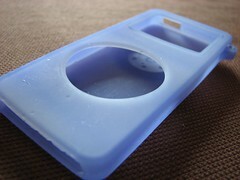 If you are looking for this case in the shops then you’re looking for the Proporta Protective Silicone Case. UPDATE: The case that I received was meant for online shipments only. The retail versions will have the relevant packaging indicating the colour changing feature. One of the best priced cases that you can find on the shelves today, this cool colour changing case provides ample protection for your Nano without restricting its functionality too much. Whilst this silicone case offers nothing extra in terms of design over other similar products, it provides adequate protection with its unique ability to change colour.